In a small saucepan, bring 1 cup water and the sugar to a boil over medium-high heat, stirring until the sugar has dissolved. Simmer, stirring occasionally, until the mixture is reduced by half, about 15 minutes. Remove the saucepan from the heat and stir in 1/2 cup mint leaves and the bourbon. Cover and let steep for 1 hour. 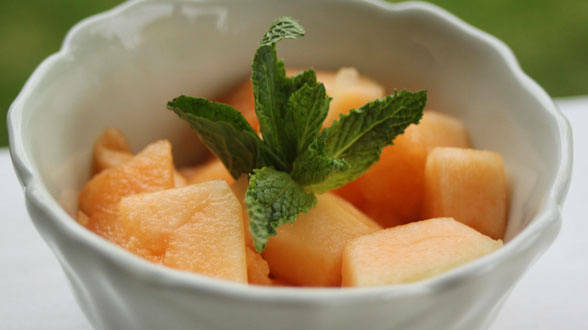 Place the cantaloupes in a serving bowl. Strain the syrup over the melon; stir in the lemon juice to taste. Cover and refrigerate for 1 hour. Top with mint sprigs. In Recipes-list.com we have selected the most viewed recipes from category - uncategorized . Enjoy the best recipes specially selected for you! Mint Julep Melon Bites is the right choice that will satisfy all your claims.